How is the camp program designed? 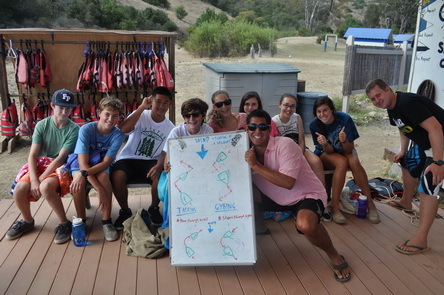 The Catalina Island Camps program blends individual success with group participation. Designed around a two-week session, our program intentionally gives campers the opportunities to grow and learn new skills as they participate in their cabin group, the camp community, and camp activities. During the first week of camp, campers participate in each camp activity as a cabin group. During the second week of the session, they participate in an overnight of their choice (campers currently in 5th grade and above) and choose specific activities that they’d like to explore further. Badgework is an opportunity for skill development in our camp activities. It is also a time where boys and girls of all ages come together to participate in activities, increasing their connection with the camp community. Each activity has four levels of skill development (white, red, blue, and gold). Campers earn stars as they develop new skills in each activity. These stars can be placed on their “CIC Year Pennant” (a triangular nautical flag) they receive for each year they attend camp. As campers earn more stars they are awarded “CIC Burgees” (a two pointed nautical flag). CIC Year Pennants and Award Burgees are often flown on a flagpole or hung on a bedroom wall. Strung together, Year Pennants and Award Burgees create a history of the camper’s years at CIC. What do campers do the first week of camp? During a camper’s first week at CIC, activities are scheduled by cabin group to provide an introduction to each activity. There are four 80-minute activity periods each day, two after breakfast and two after lunch. In addition to scheduled activities, campers have time to play recreationally and relax with their friends. Each day finishes with an evening activity, either with the whole camp together or in smaller, more reflective groups. Campfires, games, movies and dances are some of the highlights of an evening program. What do campers do the second week of camp? We begin the second week of camp with our overnight adventures on Monday and Tuesday. The 2nd through 4th graders stay in camp (they love taking over and being the only ones in camp!) for special overnight activities. The rest of camp goes on one of four overnights. Campers select an overnight that matches their interest based on location, program and type, and length of hike. Campers sleep under the stars, help prepare meals, learn Leave No Trace outdoor ethics, and get to know campers from other cabins. Hikes range from 3 miles to 15 miles. Four-week campers have the option of a day trip to Avalon instead of a second overnight. On Wednesday campers begin their badgework. Campers submit their top choices for activities and our directors create a schedule that includes as many of those activities as possible. The two-week session culminates on Sunday with the Awards Banquet, where campers are recognized for their accomplishments. The evening finishes with a closing campfire, including many great CIC traditions. What do you teach about the environment? Catalina Island is a fantastic place to develop an appreciation of the natural environment. Our nature program focuses campers’ attention on the unique ecosystem of Howlands Landing. We stress the connections between plants and animals, the relationship between humans and the environment, and our need to be stewards to preserve our special place in the world. Campers also participate in composting, and maintaining our vegetable and native plant garden. We also teach campers daily practices in which they can successfully reduce, reuse and recycle. Living on an island, we are acutely aware of what materials we bring into camp and what trash we ship back to the mainland to go into landfills, what resources we use on the island and what efforts we can use to minimize our ecological footprint. CIC Also benefits from our relationship with Jean-Michel Cousteau and the Ocean Futures Society, which has provided us with the years of experience and knowledge of one of the world’s leading supporters of the ocean environment. 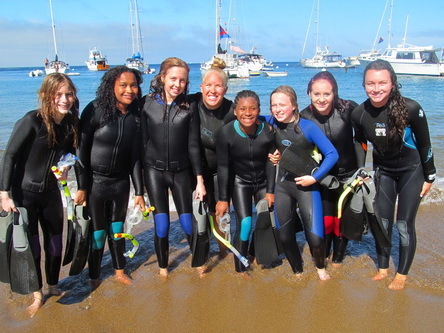 Catalina Island Camps’ school year Catalina Environmental Leadership Program (CELP) is part of the Ocean Futures Ambassadors of the Environment. Together, Ocean Futures and CIC are working to open eyes to the secret world of the ocean, so that the next generation will protect this precious resource.